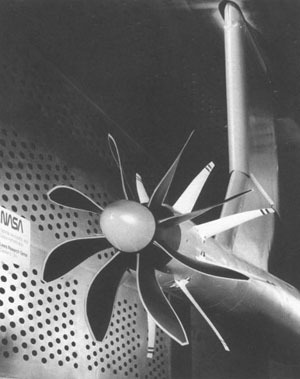 Historical image of an advanced propeller model in NASA Lewis Research Center's 8 × 6 foot supersonic wind tunnel. A propeller is a mechanical device designed to impart forward motion to an airplane or ship, operating on the screw principle. It generally consists of two or more inclined blades (airfoils) radiating from a hub, and the amount of thrust it produces is proportional to the mass of the fluid it acts on and the rate at which it accelerates the fluid. The inclination, or pitch, of the propeller blades determines the theoretical distance moved forward with each revolution. A variable-pitch propeller can be adjusted while in motion, to maximize its efficiency under different operating conditions; it may also be possible to reverse the propeller's pitch, or to "feather" it – i.e., minimize its resistance when not rotating. John Fitch, in 1796, developed the first marine screw propeller; John Ericsson perfected the first bladed propeller (1836).